How many travelers will actually agree to ride in a robo-taxi? And how will motorists react when a self-driving vehicle pulls up next to them? Launched a TV ad campaign featuring basketball star LeBron James getting his first ride in a self-driving vehicle. Proposed a standard industrywide "do-no-harm" software program to ensure safe operation of automated vehicles. Confirmed plans to deploy a fleet of 25 self-driving vehicles for road tests this year in California and Phoenix, giving journalists and the public an opportunity to see the vehicles up close. 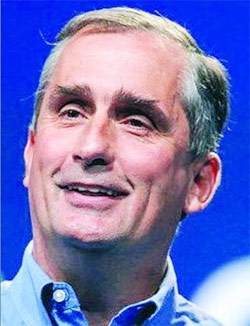 "We have to get people used to the idea that this is coming," said Intel CEO Brian Krzanich, in an interview with Automotive News. "When I talk to people, not everybody believes that it is coming as quickly as those of us in the industry know." Starting late this year, Intel will roll out a batch of 25 vehicles every three months until it has 100 automated cars on the road in Europe, the United States and Israel. The fleet will include a mix of models from most major manufacturers. Each car will be fitted with Intel's Xeon processor, which calculates vehicle routes, paired with Mobileye's EyeQ chip, which analyzes sensor data to map the road. As Intel's test fleet debuts, the company will lobby automakers, insurers and regulators to adopt a proposal to speed investigation of accidents involving automated vehicles. A self-driving car will be allowed to operate at normal speeds in mixed traffic with other vehicles. Standard industry algorithms will prevent these vehicles from making risky decisions that could trigger a collision. Industry algorithms would define the most aggressive evasive action that a vehicle can take to prevent an accident. If a car crashes, investigators would have immediate access to its sensor data to determine the cause. A self-driving car would not be held liable if the other vehicle caused the accident. Essentially, Shashua is proposing a trade-off. If the entire U.S. vehicle fleet were autonomous, there would be only 40 fatal traffic accidents annually, Shashua estimates. By comparison, there were nearly 40,000 fatalities last year on U.S. roads. In return, automakers would not be legally liable if their automated vehicles are built properly, and if another vehicle causes the accident. "We have to make good progress on this next year," Krzanich said. "The number of autonomous vehicles will grow every year. We have to get this done pretty quickly."